The future of God's work among Baptists might lie in understanding a journey to Burma 200 years ago. Next year marks the 200th anniversary of the organizing of the modern missionary movement from America, and Dr. Jerry Cain hopes Baptists will take time to remember the work of Adoniram Judson. 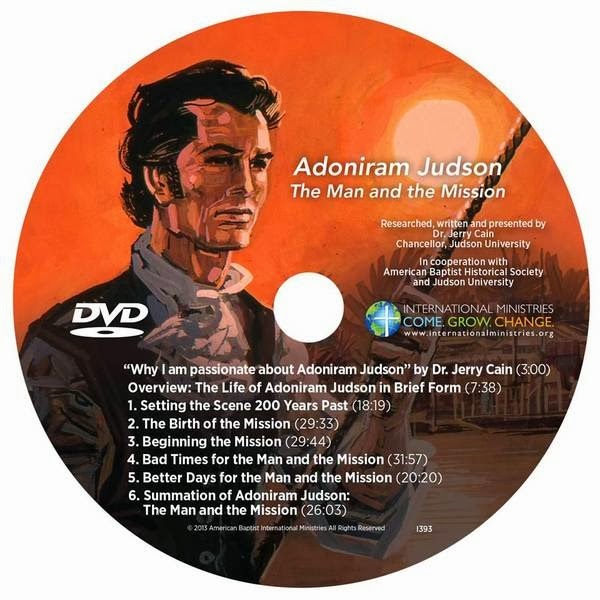 Through live talks about Judson and through promoting an informational DVD about Judson, Cain hopes to lead Baptist churches across the country to reflect on our rich missional heritage. "I want us to celebrate," Cain said in an interview. Judson's missionary tale reads like an action-packed adventure novel as he labored through war, long voyages, persecution, and the death of two wives and seven children. Yet, Judson also saw remarkable success as he translated the Bible into Burmese, started churches, and baptized many new believers. "Baptists are the ones who started [the modern missions movement from America]," Cain explained. "That's our great contribution to Christian history in America - missions." During the senior adult retreat next week, Cain will spend the morning sessions covering the birth of the modern missionary movement from America. He will talk about the people involved, influences, significance, impact, and the context from which the movement emerged. He plans to cover topics ranging from slavery to colonialism to bloodsports to theological debates about Calvinism so he can "set the scene and then have Adoniram Judson born into the scene." "My goal is to make our attendees feel proud of the work of our missionaries," Cain added. "I hope [the sessions] will be engaging and inspiring." In the evenings, Cain will preach on topics related to the theme of the retreat, which comes from a quotation by Judson: "The Future is Bright as the Promises of God." "I think all Baptist churches - regardless of the adjective - should be proud of that moment in history when we changed our status from being a cultic, sectarian group of people to changing the world with our focus on missions," Cain explained. "It's renewing our history and showing us ... what we have to be proud of," Cain stated. "We've been good at missions."